So, how much do you know about Dethatching? Well, it’s almost Fall and that means it’s “Fall lawn treatment” time, so it would be a good idea to brush up on your lawn maintenance jargon, to ensure that you do what you gotta do to keep your lawn looking good! Thatch is a tightly entwined coating of living and dead matter between the green flora and the soil’s surface. It contains stems, leaves and roots that don’t easily decay. A little thatch is actually good for your lawn, as it improves the lawn’s tolerance to the elements. However, and this is all too common in our area, too much thatch gives diseased organisms and insects a place to hide, and that leads to deterioration of your lawn. It is therefore very vital to monitor and prevent thatch build up. Luckily, dethatching a lawn, together with proper aeration (see below) is a simple enough procedure to employ to keep the thatch under control. Just keep in mind that It is important to know when is the best time for dethatching in your region (depending on the climate, different seasons may be better suited for effective dethatching) and at what levels it is best for your lawn. Of course, it is a good idea to try and figure out what the root causes of the over-thatching in your lawn are and employ some preventative measures to minimize thatching in the first place and not have to deal with excessive dethatching. Consult with your landscaping professional to determine the best and most efficient methods for your particular situation. 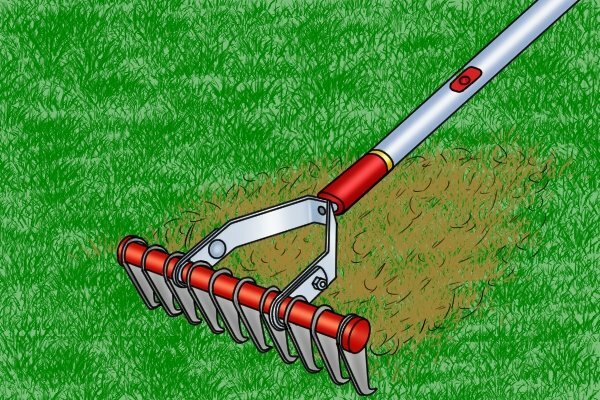 Aeration is a method of puncturing the soil turf with spikes or other equipment to remove a thin layer of soil and otherwise allow air to better circulate throughout the depth of the lawn. This lends to less puddling, better drainage and a better overall experience. One last thing to remember (until our next post). Over-seeding is a great way to keep your lawn healthy and lush. This procedure of adding grass seed on top of your existing grass, without any tearing up of the soil, is a great way to fill in bare spots and otherwise enhance the density of your turf. This is especially beneficial for older lawns that are showing signs of wear. One of the most practical times to schedule your lawn for over-seeding is in conjunction with dethatching and aeration, as this triplicate of chores collectively goes a long way to making sure your lawn is the nicest one on the block!